Be the first to share your favorite memory, photo or story of Darlene Alice. This memorial page is dedicated for family, friends and future generations to celebrate the life of their loved one. Darlene Devero Overstreet, 42, passed away Tuesday, March 26, 2019 at her residence after an extended illness. She was born May 31, 1976 to Wendell and Linda Hall Devero living in this area most of her life. 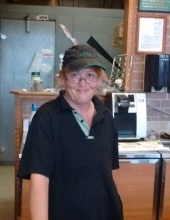 She was employed at Subway in Glennville for many years and an avid reader. She is preceded in death by her father, Wendell Devero. Visitation will begin at 2:00 pm Sunday, March 31, 2019 at Brannen Kennedy Funeral Home. Funeral Services will be held 3:00 pm, Sunday, March 31, 2019 at the Chapel of Brannen Kennedy Funeral Home with Rev. Bryan Anderson officiating. Burial will be private. To send flowers or a remembrance gift to the family of Darlene Alice Devero Overstreet, please visit our Tribute Store. "Email Address" would like to share the life celebration of Darlene Alice Devero Overstreet. Click on the "link" to go to share a favorite memory or leave a condolence message for the family.